Has anybody tried the VP4? Is it similar to the IE4? I have a Vp4 and Its great many really nice sounds. the Clean Channel is awesome MY FAVORITE channel of all, The Crunch channel is great for blues, BUT I don't like it, I Prefer getting that SRV style Overdrive I got from my Fender super 60 by juicing it with a compressor on +4 into the "hi" input. I PREFER that sound for blues. and NO I dont use a PEDAL for blues, other than my gain boost pedal, Its the only pedal I use now, and its on all the time. Better than a compressor (for me). The Gain Channels on the Vp4 can Sound Vintage or Modern depending on how you set the Treble and Mid, plus the controls are REALLY sensitive to changes so it will take a while to get it just right. Guitar> Wah > Gain Boost > Volume Pedal > Rocktron Vp4 > Rocktron Xpression > Mesa Boogie Simul 295 > Two 4x12 Cabs. What boost pedal are you using? Do you use it only on the clean channel? Love this channel for Jazz. I use a Phat Boost by Cmat mods (great pedal builder). But he doesnt make this one anymore . I think I got the last one before he stopped. I use the Phat boost on all the channels all the time to phatten up the signal of my guitars. My my main guitar is a Fender 7 string with a real floyd and one EMG 81-7 pickup. I use it with other 6 string guitars, but prefer the 7 string. I run my preamp at 3/4 volume. and the 295 Poweramp all the way up on 10 I controll my OVERALL volume with my Xpression's output knob. ZERO noise and a very tight sound if you want it. the Vp4 is also MODULAR! so You can install Randall or Egnater single channel modules. in it. very few know about this and the ones who do aren't telling. WoW! You must be deaf!! That's got to be loud but i'm sure it sounds great!! About the modules fitting in the VP4, have you tried this? Do you have to do any mods? That would be pretty cool if that's true. I admit I'm a bit of a metal head , but I play alot of different stuff. Yes they will fit. 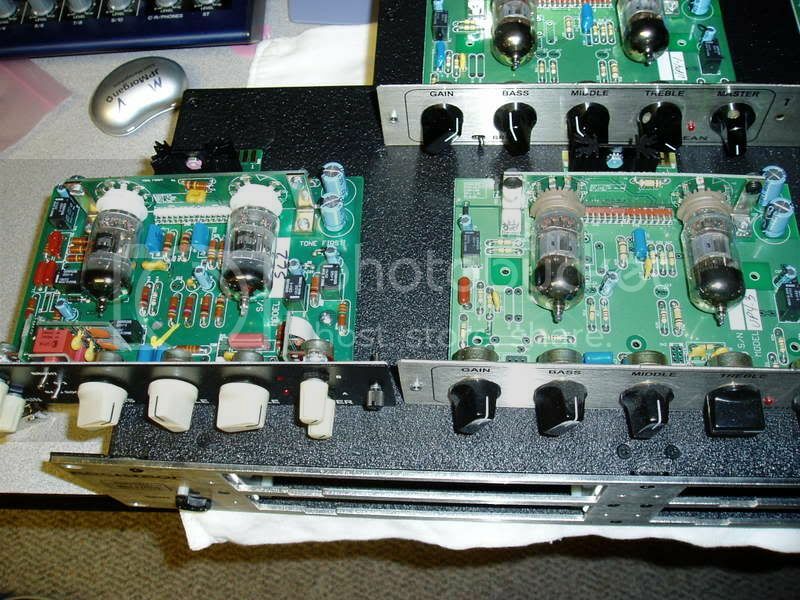 the Vp4 Chassis is basicaly early Egnater m4/Randall rm4, minus the effects loop. 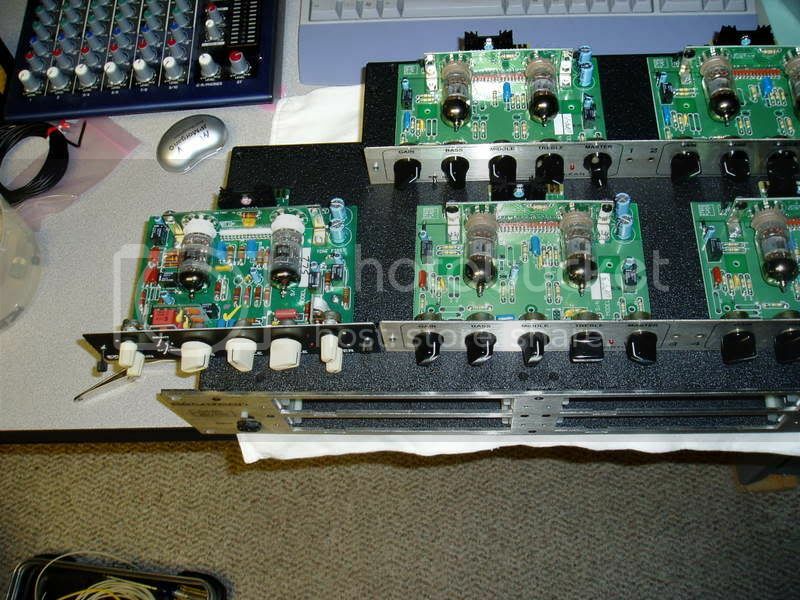 the pcb's are the basicaly same as the randall layout wise. The only mod you would have to do change or cut the face plates and they are connected together. or you could just remove them (existing faceplates) and install randalls faceplates. I'll gets some pics up in about a week. maeshuggah wrote: I'll gets some pics up in about a week. 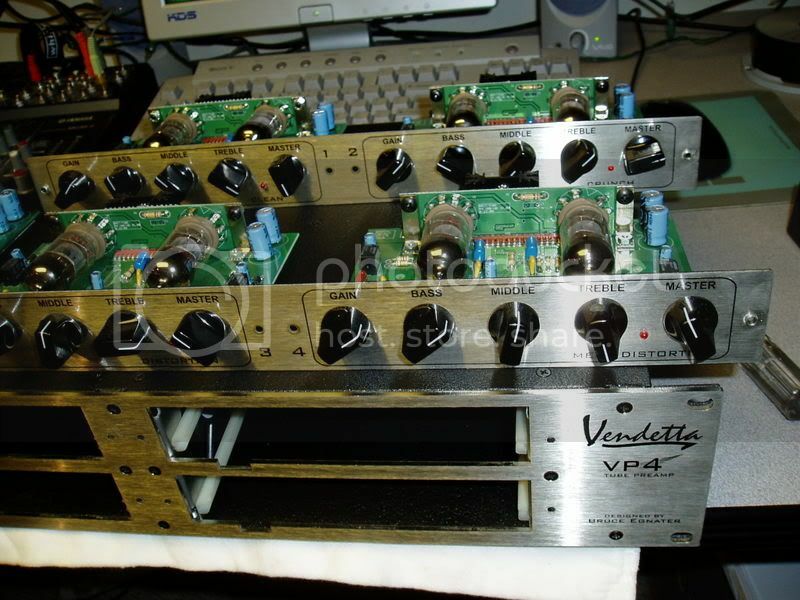 Hey Maes, can you post some pics of your VP4 with Randall/Egnater Modules? Iscored a VP-4 from the Amp Lounge. It ought to be here in a few days. the board says "Mod 100: Rev. 1.01"
I threw the SL2 in the pic for comparison. I ran a DBX226Xl compressor in front of my preamp and it gave it a nice boost that put channel 4 over top in terms of gain which I thought was slightly lacking in the first place.